Coffee shops aren’t the only third spaces. Find out how hotel renovations — from low cost to large scale — are helping to boost hotel revenues and attract more guests. 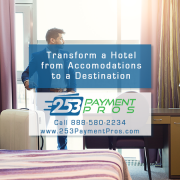 With a little ‘third space thinking,’ you can make simple renovations in your hotel, motel or bed and breakfast in order to bring in new guests and increase profits and sales in your hospitality establishment. Although only recently made part of the lexicon of the US consumer, third spaces existed long before the popularity of Starbucks® as a business or social flex space brought the term to the forefront. 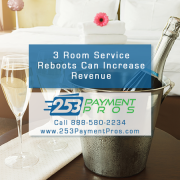 With a little ‘third space thinking,’ you can make simple renovations in your hotel, motel or bed and breakfast in order to bring in new guests and increase profits and sales in your hospitality establishment. The third space (also called the third place) is a term which refers to social spaces separate from home (the first space) and work (the second space). These third spaces become gathering places and accommodate a variety of community building activities, from purely social affairs to business and networking groups, gatherings for people with common interests or hobbies, extended offices and more. While modern US coffee shops like Starbucks® have adopted the phrase, third spaces existed decades before coffee houses monopolized the term. For years, the barber shop and salon served as an unofficial neighborhood meeting place; also, gathering places like country clubs and civic clubs (like Eagles and Elks organizations) and sometimes even neighborhood restaurants and bars have served as third spaces in US communities for hundreds of years. Hotels, motels and bed and breakfast type hospitality businesses that engage in third space thinking are boosting revenues by redesigning common areas to keep hotel guests from wandering outside for meals, meetings and entertainment, and using these same spaces to help bring in new hotel guests, too. It’s a great example of hotel trends that are helping hoteliers re-imagine the role of their facilities. Marriott International© remodeled lobbies as “great rooms” with free Wi-Fi, comfortable seating and menus featuring small dishes and local craft beers. Starwood Hotels & Resorts Worldwide© revamped its Sheraton brand by remodeling Sheraton lobbies with communal areas, modern furnishings and décor, improved lighting, and upscale wine lists and flat screen TVs at the bar. Afterward, the Chicago Sheraton sold 24 percent more wine during the first six months than it did the previous year. Sheraton© lobbies were first remodeled with guest amenities in mind way back in 2006, when, in partnership with Microsoft, it provided free computers for guests; soon after they found themselves also selling coffee and snacks. While 5.8 million Sheraton hotel guests use the gym, more than 15 million use the computers every year. 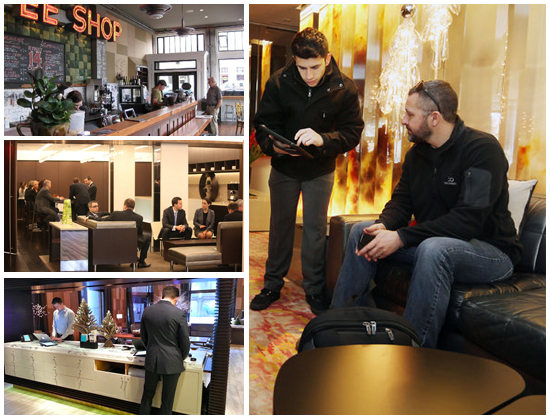 Hyatt Regency hotels in Chicago, New York, Atlanta and San Francisco have added clusters of chairs and couches as well as a grab-and-go marketplace and restaurant that over flows into its lobbies. 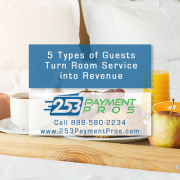 It stands to reason that guests will pay more to stay at a hotel that offers better guest amenities – amenities that go beyond the hotel room into the common areas of the hotel itself. 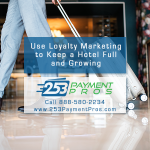 Not only will they pay more to receive more, but they will also be more likely to return as a loyal hotel patron, refer friends, family and colleagues to the hotel and leave positive reviews and ratings for the hotel online. Obviously when it comes to these hotel trends, hotel renovation and remodeling projects can be expensive – but they don’t have to be! Remodeling an entire room – or even an entire floor – within a hotel can be costly; creating conversation areas within a lobby can be done for a fraction of the price! Create conversation areas or mini-seating areas conducive to families, business meetings or computer use. In the evening, turn these micro-lounges into a space where guests can enjoy a cocktail, wine or beer before going to your restaurant (or going out) for dinner, or where they can relax with a beverage prior to returning to their room for the night. 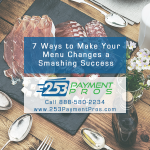 Adding a grab-and-go marketplace, coffee or wine bar to your hotel can be done in a much smaller space – and for a smaller price tag – than trying to add or remodel a large hotel restaurant. Think about your guests in terms of segments (families, business travelers, etc.) and plan for a small buffet or grab-and-go type options that would be perfect for business breakfasts or lunches. Cities – and even neighborhoods – often have their own unique “flavor” in terms of local food and beverage favorites, art and music. 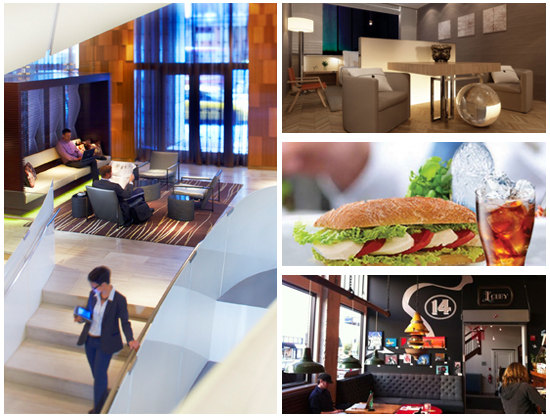 Why not infuse some of the local ambiance into your hotel lobby in order to leave a lasting impression with guests? Feature the work of local artists, offer tastings of local craft beers and wines and feature live music – right in your lobby. If you have a smartphone or tablet, you have the technology at your fingertips (literally) to make the one constant of every hotel much more convenient for your guests: The hotel check in process. Make it as easy as possible for guests to check in and offer up digital coupons for use in your hotel’s restaurants, bars and other guest amenities during their stay. 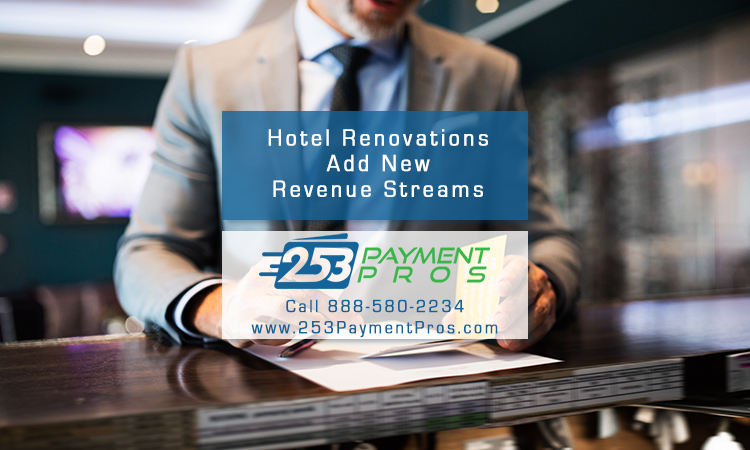 From hotel merchant services and credit card processing to hotel financing, we have great resources for growing a hotel business through renovations and revenue-boosting third space ideas.